After scouring the internet for unique ideas on what to dress my daughter up as for Halloween, I finally found it! It was something so unique and not done at all in my tiny small town. Yes the traditional store bought costumes are just fine and I’m sure your child will love looking like at least other kids in their class, but oh no!!! not for my kid. So I took to my hot glue gun (my crafty best friend) and got to work. Many many many hours of hot work. Since it was typically cold in October, I took one of her fleece jackets she already had. Luckily for me, it was the perfect color of pink, white, and purple. I then cut out over 300 felt feathers in coordinating pink, purple, white, and I added teal because it looked so cute together. I created a pattern with the colors and then glued my little heart. Yes, I did get burned many many times. But it was so worth it. I then bought pink tights for the legs of the owl and luckily she had brown boots for the feet. As for the mask, I did buy a plastic mask but then cut out bigger eye holes and layed matching pink felt over for the face and made a beak to go. Of course I had to make it extra adorable and put a huge flower in her hair. The reaction she got was beyond what I expected. She got her picture on the school web site, we were stopped numerous times while trick or treating, and every house we went to the reactions were increadible. I could even over hear other parents talking about her costume and saying just how cute and adorable it was. 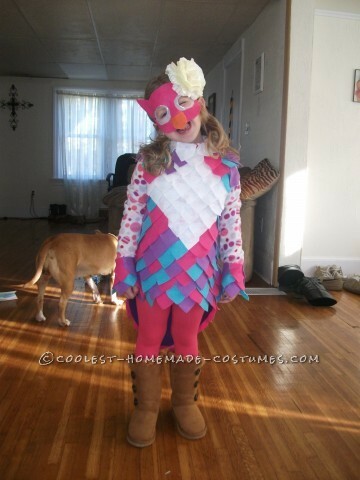 I felt like such a proud mom for giving my daughter the coolest girl owl costume!! !